16 August 2016. A new drug being tested as a leukemia treatment was shown in lab mice to reduce inflammatory white blood cells that lead to a build-up of arterial plaques and heart disease. The study at Massachusetts General Hospital and Harvard Medical School tested the drug code-named GMI-1271 made by GlycoMimetics Inc. in Rockville, Maryland, with results reported recently in the journal Arteriosclerosis, Thrombosis, and Vascular Biology (paid subscription required). GlycoMimetics is a biotechnology company that discovers and develops therapies acting on carbohydrates in cell processes. The company says carbohydrate structures account for much of the complexity and functions of proteins, with nearly all proteins expressed by human cells affected by complex carbohydrates on the surface of those proteins. The therapies discovered and developed by GlycoMimetics are synthesized compounds that mimic the structure and activity of carbohydrates, designed to function like traditional drugs, but also to enhance biological functions more than natural carbohydrates. GMI-1271 is designed to limit effects of E-selectin, a protein found in cells lining blood vessels, and believed responsible for accumulations of white blood cells at inflammation sites that stick to blood vessel walls. GlycoMimetics is testing GMI-1271 in early and intermediate-stage clinical trials as a small molecule, or low molecular weight, supplemental treatment for blood-related cancers acute myeloid leukemia, or AML, and multiple myeloma. 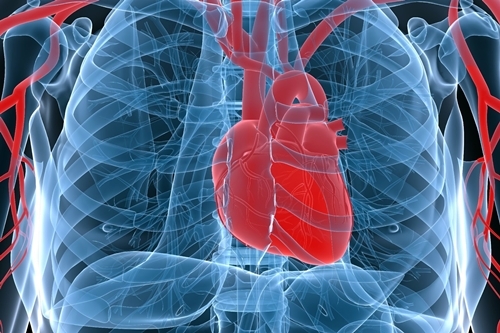 The company, however, sees potential for GMI-1271 with cardiovascular disorders. In the paper, researchers tested effects in lab mice of GMI-1271 to limit the impact of E-selectin in producing inflammatory white blood cells in the spleen that then travel out through the blood stream, a condition occurring after myocardial infarction or heart attack. The drug was given to mice following induced atherosclerosis, or hardening of the arteries, and heart attack. The results show mice in this condition given GMI-1271 reduced their production of inflammatory white blood cells and precursor cells in the spleen, as a result of blocking the actions of E-selectin. Because of lower inflammatory cell production, plaque build-ups in mice arteries stabilized, reducing the risk of a repeat heart attack. “The results in this animal model of myocardial infarction and atherosclerosis demonstrate both the biological activity of GMI-1271 and the possible broader uses of an E-selectin antagonist,” says John Magnani, chief scientist at GlycoMimetics in a company statement. “While GlycoMimetics is currently focused on developing GMI-1271 for treatment of AML, this drug candidate has shown activity in preclinical models of a number of diseases where E-selectin plays a key functional role.” Magnani is also a co-author of the paper. GlycoMimetics is already pursuing other applications GMI-1271 as a cardiovascular drug. The company is recruiting participants in an early and intermediate-stage clinical trial testing the drug as a treatment for deep vein thrombosis.